Typical southern New England saltmarshes were historically dominated by high marsh meadow, containing Spartina patens and other marsh grasses and shrubs, but Rhode Island salt marshes have transitioned to smooth cordgrass-dominant (Spartina alterniflora) ecosystems, signaling an ecological transition. The change is likely related to accelerated sea level rise associated with climate change and several consecutive years of higher than average tides. The transition indicates salt marsh stress from increased flooding and shows how salt marshes are being impacted by global climate trends. A recent study found that over the last 40 years, Rhode Island has lost about 17% of its vegetated salt marsh area due to stress associated with sea-level rise; if these trends continue, salt marshes will be lost at an increasing rate. Sea level rise from climate change is a significant threat to Rhode Island’s salt marshes. Marsh drowning occurs when sea level rise accelerates to a point where the marsh plants—which have a natural tolerance for being submerged during portions of the tidal cycle—are submerged too frequently. This can lead to die off of the marsh plants and degradation of the marsh. Rhode Island’s sea level rose an average of 0.1 inches per year since 1931, and an average of 0.14 inches each year from 1990 to the present, for a total of over nine inches since 1930. Models predict additional sea level rises of between 0.12 to 0.89 inches each year through the year 2100. The National Oceanic and Atmospheric Administration’s latest models now show a “worst case scenario” of over 9 feet of sea-level rise by 2100. Expanding pool area causing stressed marsh vegetation and vegetation die off. Photo courtesy of Wenley Ferguson, Save The Bay. Salt marshes have survived lower rates of sea level rise in two ways: accretion and marsh migration. Marshes are able to accrete, or naturally rise in elevation, by trapping decaying organic matter and sediment that combines with marsh vegetation material to form soil over time. When the rate of sea level rise accelerates, marshes will not be able to accrete fast enough to keep from drowning. Marshes in Rhode Island currently accrete at rates of 0.11 to 0.27 inches per year; however, factors such as the presence of certain invasive species or human development cutting off the marsh from natural tidal flows may reduce the accretion rate of our salt marshes by reducing the amount of sediment delivered. In any case, the rate of natural accretion is dwarfed by the rate at which sea levels are rising: 0.12 to 0.89 inches each year. Additionally, marshes can migrate inland as rising sea levels result in tidal flooding further inland, leading to the creation of new marsh as the previous areas are degraded; however, both manmade—e.g., a sea wall—and natural—e.g., a bluff—obstacles limit marsh migration. RI’s Coastal Resources Management Council assessed the impact of sea level rise on the state’s salt marshes in its Sea Level Affecting Marshes Model (SLAMM). SLAMM takes into account various projections of sea level rise as well as the current location and elevation of salt marshes. At a sea level rise of three feet, an amount that Rhode Island will certainly exceed by 2100 without extreme mitigation measures, SLAMM predicts that half of Rhode Island’s currently existing salt marshes will be lost. Marsh migration may increase the upland extent of salt marshes, but, in most places, migration is not a realistic option due to hardened shorelines, roads, and other development. Sea level rise can have additional impacts on salt marshes. Ponding, where pools of deeper water form in a marsh, is a natural process, but sea level rise can accelerate ponding, which degrades marsh quality. 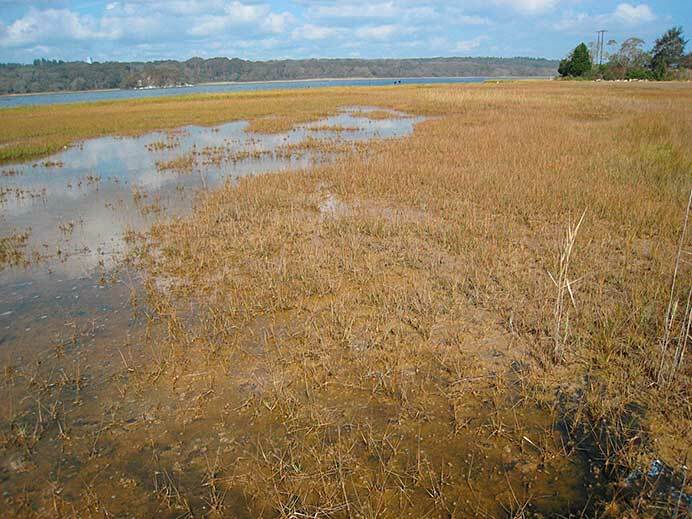 When water does not drain from the marsh at low tides, it can create high salinity conditions and continually flooded conditions that cause salt marsh vegetation to die off. The death of the vegetation results in expansion of the ponded area and creates a feedback loop that continually exacerbates the degradation of the marsh. Monitoring salt marshes helps us understand and plan for the future of salt marshes, including protecting areas that provide migration pathways where marshes may be able to move inland as sea levels rise. Plantings of marsh grass on restored marsh at Sachuest Point National Wildlife Refuge. Photo courtesy of CRMC.